We tested 16 models of Japan's popular multipurpose santoku knife to find the best. Whenever a newlywed couple asks me for advice on what kitchen knives to put on their registry, I always say the same thing: Avoid knife sets, which force you to overpay for less important knives, like paring knives and serrated knives. Instead, invest in two good primary knives. Two, because the couple will probably sometimes cook together, and they're each going to need a blade that's up to the task. One of those blades should absolutely be a good chef's knife, a true workhorse of the kitchen. The other could be a second chef's knife, but I think it's fun to take advantage of the doubling-up to add a little variety. That's why I say the second knife should be a santoku. This santoku knife from MAC's Professional line is an absolute pleasure to use, no matter the task. It's lightweight, well balanced, sharp as can be, and comfortable to hold. It made perfect carrot cuts, broke down a chicken with ease, and filleted a whole fish as if it were a fish-shaped block of butter. It's hard to know how much the "granton" hollows along the blade really help, but given how effortless this knife was to use, they may well be adding to the ease; at the very least, they're doing no harm. Tojiro's santoku knife held its own throughout the testing, butchering a chicken without trouble and filleting a fish perfectly, too. It feels a little chunkier in the hand than our top pick, and it cracked one slice of carrot before sailing through a dozen more slices without any problems. It's a well-made knife, offering an excellent money-to-quality ratio. Santoku knives have not been a part of Japan's storied blade tradition for long. Instead, they were created in the mid-20th century as a home cook's multipurpose knife—the name, in Japanese, translates to "three virtues." Most sources say those three virtues are working with meat, fish, and vegetables, though I've seen at least one publication say the term may also refer to three different cutting techniques: slicing, dicing, and chopping. The santoku would best be described as a Japanese Western-style knife. Traditional Japanese knives, for reference, tend to have a single bevel (also called a chisel bevel), in which the blade tapers to the edge on only one side. Japanese steel also tends to be harder than Western steel, meaning it holds an edge longer but is more prone to chipping; these knives don't do well with honing steels and require more frequent trips to the whetstone to keep a good edge on them. Western knives, in comparison, usually have an even double-bevel edge geometry, meaning the fine edge tapers to a point from both sides like the letter v. Western steel also tends to be a bit softer, making it less prone to chipping, which means you have the option of being a little rougher with it. You can hack through bones and such (a big no-no with Japanese knives) and do quick touch-ups on the blade with a honing steel in between less frequent whetstone sessions. A santoku combines those qualities: The steel is usually hard (although now enough Western knife-makers are in the santoku game that there are plenty of options made with softer Western steel), but the blade edge is often somewhere between a Japanese chisel design and a Western double-bevel. Today, you can also find a lot of santoku knives with an even double-bevel edge, from both Japanese and Western knife-makers. Perhaps more important than any of these more technical specs is the profile of the santoku knife. On average, it's shorter than most chef's knives, with blades in the six- to seven-inch range. And, instead of the more dramatic curved blade on a Western chef's knife, which allows for more effective rocking-chopping and -slicing, a santoku knife has a much flatter blade—it's good for shorter, downward strokes. The blade of a santoku is quite tall, giving it a bit of heft that such a short knife would otherwise lack, and its spine curves down significantly to meet the tip. This blade shape is sometimes called a sheep's foot blade, which is fairly common for paring knives. As we remind our readers in all of our knife reviews, there's no one right answer for what the "best" knife is, since it's a highly personal decision. What feels right in my hand may not be what feels right in yours. Still, there are some clear requirements we can set out that any good santoku knife should meet. First, a santoku knife should be deadly-sharp right out of the box. I know—some knife experts out there are more than happy to get an otherwise excellent knife and put their own finishing touches on the edge to get it to peak sharpness, but those people aren't your average home cook. As much as I'd love for everyone to learn to sharpen their own knives, the reality is that it'd be a miracle if most home cooks had their knives sharpened by a professional even once a year. The sharper a knife starts out, the more of a head start it'll give the user before requiring an intervention. Second, a santoku knife should be fairly lightweight and comfortable. The whole idea of a santoku knife is that it's compact and deft, an easy knife for anyone regardless of how developed their forearms are. Some knife-makers are offering hulking santokus that weigh nearly as much as a larger chef's knife, but that defeats the purpose of a santoku. If you want a big, burly knife, just buy a large German chef's knife and be done with it. A santoku should be comfortable to hold either by the handle or with a pinch-grip on the blade, and it should feel well balanced. To be clear, though, balance is not an absolute and easily measured quality; it, too, is personal. How balanced a knife feels in the hand depends on who's holding it, how they hold it, and how they like the weight of the knife to rest in their hand. Last, I think a strong argument can be made that a santoku shouldn't be wildly expensive. It's meant to be an all-purpose home cook's knife, and, as such, there's no need for it to reach the price point of more specialized, high-end knives. While I looked at knives up to $200 in price for this review, I ultimately couldn't justify any of the options that cost more than $150. It'd be like paying $400 for a pair of sweatpants: It misses the whole point. For this review, I tested 16 santoku knives from most of the major knife brands widely available in the United States. I started my tests with a simple paper-slicing exercise to determine blade sharpness and weed out any that were too dull out of the box. After that, I decided it'd be fun to put the santoku's name to the test, using each knife to cut vegetables, break down a chicken, and fillet a whole fish. If a santoku really is a three-virtues knife, it should handle all of those tasks well, even if it doesn't do so quite as well or as dexterously as knives specially designed for each of those tasks. To finish my tests, I ran the blades through the paper-slicing test one more time, just to see if using them had noticeably dulled the blades. To start and end our assessment of each knife, we ran them through pieces of parchment paper, to see which knives could repeatedly slice their way through cleanly, without snagging, tearing, or catching on the paper at any point. Since we were looking for knives that arrived with truly sharp blades, we disqualified any that repeatedly got caught on or messily tore the paper. After all the subsequent testing with vegetables, meat, and fish, we repeated this test with the remaining knives, just to make sure none had lost their edge after a short period of use. A santoku knife is an all-purpose knife, but without a doubt the task any new santoku owner will use it for most will be to cut fruit and vegetables—dicing onions and carrots, slicing tomatoes, mincing garlic, and so forth. The most telling test is slicing tomatoes, a soft fruit with a slippery, taut skin, and carrots, which are dense, hard, and prone to cracking if split too aggressively. I ran the knives through both vegetables, slicing ripe farmers market tomatoes to see which knives could quickly bite into the skin and then slide through the tomato flesh without crushing it. Then I cut carrots a variety of ways: into thin rounds, into long sticks, and into slabs that I crosscut into matchsticks and then crosscut again into brunoise. Any knives that had trouble with the tomatoes, or that repeatedly cracked the carrots instead of cleanly slicing through them, were disqualified. I also noted whether any of the knives felt difficult to control when I made precision cuts. To measure each santoku knife's prowess with meat, I used each one to break down a whole chicken, then cut the meat into smaller pieces. The santoku would never be my first pick for this type of task—the tall blade and lack of a true point make it less than ideal for butchering. But then, I own a large collection of knives, including lots of specialty blades. If I were a home cook with a limited number of options, it'd be nice to know that a santoku could get through the task with minimal difficulty. Filleting a fish is a task few home cooks feel comfortable doing, but it's one a good santoku should be able to accomplish. As with the chicken test above, a santoku wouldn't be the first knife I'd grab if I had other, more specialized options nearby. But, as with the chicken, if some of these knives could do a better job with it than others, more power to them. To find out, I bought a bunch of whole fish, mostly black bass, and got to work, first cutting off each fillet, then skinning and trimming it. Unlike with the chicken test, some real differences emerged here. Some of the knives that had done decently in the tomato and chicken tests failed to pierce the skin near the fish's spine with ease; one slid off so abruptly that it easily could've slashed my hand had I not been holding the fish safely. A handful of knives, though, were able to get through the skin in an instant, and then managed to separate flesh from bone. The winners sailed through all the tests we threw at them, were comfortable to hold, felt well balanced and relatively lightweight, and were easy to control. They also offered good value at their respective price points. MAC's MSK-65 Professional Hollow Edge santoku is just a pleasure to use, no matter the task. It aced every test, cutting perfect tomato slices, gliding through dense carrots, butchering the chicken, and neatly filleting the fish. It's often hard to tell for sure whether the hollow-ground divots along the blade, which are sometimes called "granton" and are intended to reduce drag during slicing due to less surface area coming in contact with the food, are effective. But the MAC sure seemed like it slid through the chicken and fish more easily than the other knives. The knife has a comfortable handle of pakkawood—a composite material, made from both wood and plastic, that's attractive yet durable—and a thin six-and-a-half-inch blade. Though it's made in Japan, this knife features an even 50/50 blade geometry just like traditional Western knives, making it as well suited to lefties as to righties, and easier to sharpen for those who don't know how to apply the different angles many Japanese blades require on each side. Tojiro has long been one of my favorite mid-priced knife brands, offering excellent quality at a very reasonable price. This santoku knife doesn't disappoint on either front—in fact, it's one I've used regularly for years in the Serious Eats test kitchen (we purchased a brand-new knife for this review, though). It feels slightly chunkier and heavier than the winning MAC knife, but it's still comfortable to hold and use. If the Tojiro isn't available, I also liked MAC's Superior Santoku Knife, which is priced similarly and also performed well in all the tests. I've been increasingly impressed with some of Mercer's offerings; in my chef's knife review, it came out on top on the budget end of the spectrum. Here, too, it showed its strength—an incredibly affordable blade with excellent performance. 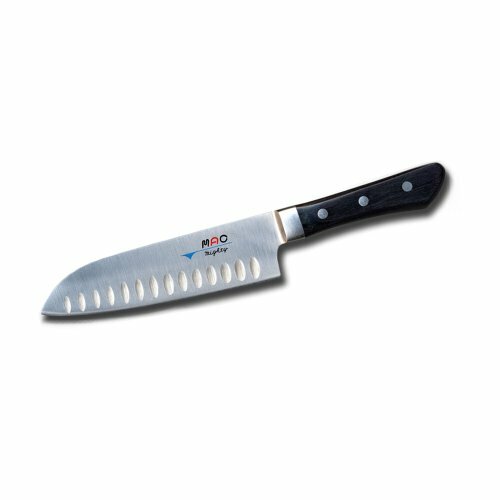 The knife has a textured handle made of Santoprene (a composite of plastic and rubber), giving you a sure non-slip grip even with wet hands. And, like the MAC, it has hollow-ground divots to reduce friction during slicing. I wasn't able to notice any huge differences there, but they sure don't hurt. Given the fact that the Mercer did a commendable job with all the tasks I put it through, plus its affordable price point, this one seems like a no-brainer to add to the knife drawer. It's the perfect knife to hand to guests in your kitchen, so you don't have to worry about whether they're trashing your pricier knives, and it's good as a trial blade for those who want to test the santoku waters without too much commitment. The Wüsthof Pro Hollow Ground Santoku Knife felt too flimsy during carrot-cutting and had an edge that felt sluggish as it moved through the paper and vegetables. Shun's Classic 7-Inch Santoku Knife performed well overall, but it felt a little on the heavy side, and it has a high price tag that didn't deliver a clear performance benefit. For whatever reason, Tojiro's DP 7-Inch Hollow Edge Santoku Knife didn't perform as well as the Tojiro that earned a recommendation here; it cracked carrots repeatedly and felt sluggish through the tomatoes. Global's Hollow Ground Santoku performed well overall, but it felt large and clunky; it also snagged several times during the paper test. Victorinox's 7-Inch Fibrox Pro Santoku Knife With Granton Blade was the runner-up for my affordable-santoku recommendation, but it couldn't quite best the Mercer in price or performance. Still, it's a good low-cost choice. I was pleasantly surprised by the Zwilling J. A. Henckels Twin Signature 7" Hollow Edge Santoku. It was a little on the large side for my taste, and it didn't look to be of the highest-quality build compared with other knives at similar price points, but it performed well in the tests. MAC's Superior Santoku Knife performed well in all tests and is my runner-up in the mid-level category. Messermeister's Meridan Elite Kullenschliff Santoku Knife felt sluggish as it dragged through much of the food; for the price, I think there are better options. The Zwilling J. A. Henckels Pro 7 Rocking Santoku Knife was on the heavy side, but made it through all these tests with ease. I liked the pointed top on it, which made working with the whole chicken and fish easier. The Misono UX10 Santoku is a great knife, but it didn't distinguish itself enough to justify the considerably higher price. Wüsthof's 8" Santoku Hollow Edge Classic caught slightly on the paper and felt slow when slicing through the carrot.